Spicers Group owners Jude and Graham Turner. The group currently owns seven high end boutique assets, with six of those in Queensland and the other in NSW’s Hunter Valley. CBRE Hotels’ Andrew Jackson and Paul Kapiris sold the property at a hotly contested Auction for $5.9m, equating to $236,000 per room and a 7.3% passing yield. 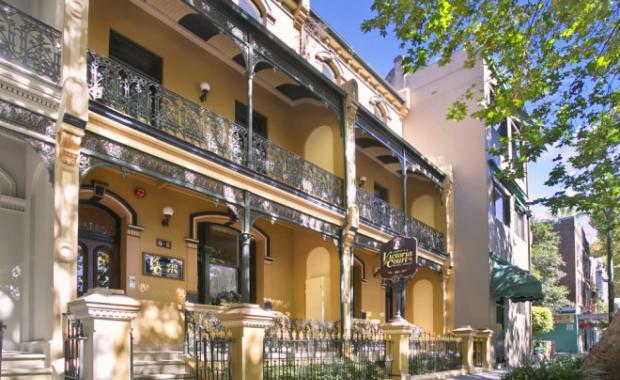 It is understood that the Turner’s have plans to re-develop the two adjoining heritage terraces into a boutique hotel asset in line with the high-end Spicers Group brand. Jude Turner plays a central role in the Spicers vision – sourcing, designing and styling the retreats – while her husband, Graham, brings his travel industry experience as co-founder of Flight Centre Pty Ltd.
“Private investors are not often presented the chance to purchase a hotel so close to the Sydney CBD. The assets are tightly held due to their simplicity of operation, consistent cash flows and continuing positive Sydney hotel market fundamentals,” said CBRE’s Andrew Jackson. CBRE reported that the auction campaign generated over 200 enquiries, 30 inspections and 7-8 genuine bidders. Interest was registered from domestic and international investors, including a number of Chinese groups keen to secure a foothold in the tightly held and lucrative Sydney hotel market. Hotel valuer, Heath Craig from Landmark White, is not surprised by the yield.